Identification: Antennal clubs are black. 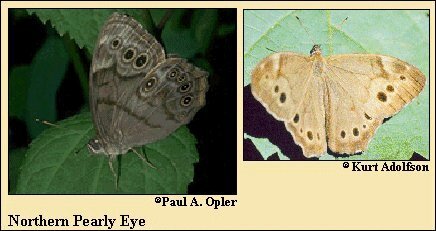 Upperside is brown with dark eyespots. Underside is brown; submarginal row of 4 black spots on forewing is straight and the dark line inside it is sinuous. Spots are not surrounded by diffuse white. Life history: Males perch on tree trunks or vegetation up to 10 feet above ground at edges of clearings to wait for females. Eggs are laid singly on the host plant; third- and fourth-stage caterpillars hibernate. Flight: One brood in the north from June-August, two broods in the south from May-September. Caterpillar hosts: Various grasses including white grass (Leersia virginica), bearded shorthusk (Brachyelytrum erectum), plumegrass (Erianthus), broadleaf uniola (Uniola latifolia), and bottlebrush (Hystrix patula). Adult food: Dung, fungi, carrion, and sap from willows, poplars, and birch. Habitat: Damp deciduous woods, usually near marshes or waterways; mixed or grassy woodlands. Range: Central Saskatchewan and eastern Nebraska east to Nova Scotia, south to central Alabama and Mississippi.